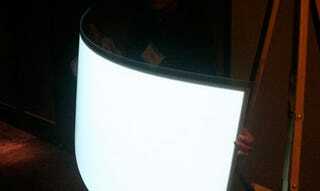 We know how excited you are about the advent of super-thin bendable OLEDs, but they do have their size limitations. (It's the reason that Sony can only market an 11-inch display now.) Pennsylvania-based startup CeeLite is working on a different technology for bendy displays of a much larger order. CeeLites are just 1/8" thick and use up just 4 watts of power per square foot, but can be made into banners 12 feet long and 30 inches high. Rather than OLEDs, they use light-emitting capacitors that emit electricity into a phosphorescent substrate. They may not have all the magical properties of OLEDs, and they won't be made into high-def TVs anytime soon, but they can be contained in simple plastic, which makes them more easy to bring to market than OLEDs. You might start seeing illuminated wall panels in restaurants and or self-lighting ads on the sides of buses.